DocuWare is the perfect document management system for keeping track of all your Human Resources (HR) documents. For a smooth introduction into managing digital personnel records, we have compiled 7 professional tips. They help ensure a seamless conversion and system adoption by your colleagues. As with most projects, you should ask yourself what you ultimately want to achieve with your HR files in DocuWare. Our 7 tips will help you answer the following questions. Which documents need to be stored? Will you be using your HR file cabinet only for specific employee-related documents such as applications, salary receipts, payroll records, tax certificates, sick day/holiday requests. Or would you like to use the HR archive as a comprehensive knowledge platform within the HR organisation? For example, for all benefits, email exchanges with employment agencies and professional associations, texts and pictures for job advertisements and much more. 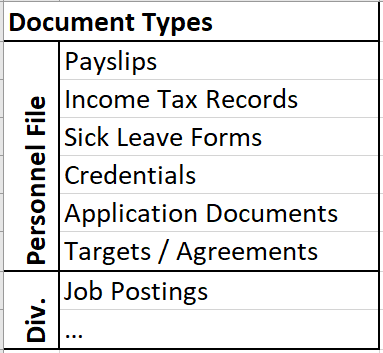 Tip 1: If you bundle all documents into one file cabinet, you should use an index field to assign/restrict documents to individual positions in HR management: In addition to “Personnel Files”, these may be areas like recruiting and personnel development. Tip 2: Make a matrix that includes all document types that you want to store in your HR file cabinet. This facilitates the planning of the index fields and access rights in the next steps. Data protection is an extremely important issue in HR management. Planned with care from the outset, it will save you tons of time in additional improvements and creates trust from the beginning among the staff. Tip 3: First of all, divide your employees into groups of persons, for example categories like: HR team, corporate management, department heads, employees, etc. Think about who is allowed to do what with which documents. For example, who should be able to search, store, alter, delete, etc. If you want to allow documents to be edited in the file cabinet, think about using version management. Changes can then be easily tracked. Tip 4: Now expand your matrix to include document types and assign the rights of the different groups of people. This makes it clear for planning and forms a good basis for configuring the various file cabinet profiles. Which index fields do you need? Once again based on the document matrix, you can create a useful organisational and storage structure. Usually fewer index fields than initially thought are needed. Standard fields for a classic HR file cabinet include: name, personnel number, document type, subject and date. If non-personnel documents should be retained in the same archive, use another field for the HR area (see Tip 1). In addition, a status field is useful for processes like automatic delete workflows for rejected applications or the personnel records of employees who have left the company. Below the sample matrix is now supplemented with the defined index fields. “List” stands for entry from a select list, “Free” for free entry. Since the personnel number can usually be assigned by name, this can be filled in automatically with Autoindex. The same is also possible for the department’s entry for personnel documents. Want to use a classic file structure? Tip 6: For your index fields, think of the possible use of the folder structure. Find out more about searching in folders. How to deal with your old paper files? Don’t be afraid to switch to efficient working with digital documents just because you have countless old records in a paper format. Instead of scanning everything, just keep your old paper files, at least at first. Tip 7: Define a starting point for the digital personnel files. From this point onwards, all new personnel documents are managed in DocuWare. It is only when you notice that certain legacy data needs to be accessed more frequently. Then you can target these for scanning and place them in the system. They can even be flagged as document type “legacy data” in the digital HR archive. Call the team today to find out how DocuWare can improve your HR processes on 0161 667 3390 or email sales@doctech.co.uk.